Guwahati, Nov 26: Sakshi (bantam-weight) and Nitu (light-fly) entered the finals of the AIBA Women's Youth World Boxing Championships here on Saturday. Their victories mean India has as many as five finalists in this elite championships for the first time. The third Indian in the fray Anupama somehow fell short when she came up against Russia's Anastasiia Rybak in the light heavy division and went down 0-5. Sakshi made it to the final in style, forcing Japanese Sena Irie's coach to throw in the towel as his ward was getting the beating of her life. She was on top right from the beginning but she literally went on a rampage in the second round. Nitu, on the other hand, was lucky to win her bout by a split decision as the two boxers exchanged punches sporadically. While her Chinese opponent Yuan Nie waited for opportune moments to strike, Nitu, a southpaw, preferred to probe with her jabs. But it was the Chinese who found her target with more success in the first round, to take a marginal edge. Nitu moved better in the second and third rounds but she breached Yuan's defence only when she unleashed her stronger left straight to her jaw or face. She did come up with the occasional burst of punches, attacking Yuan's stomach. It was a slow scoring bout all through but midway through the third, Nitu, knowing that she had to do a bit more to turn the tide in her favour, decided to loosen her arms and went into attack mode. She released four or five punches in short bursts, finding Yuan's head and midriff with greater success. Sakshi turned out to be the toast of the evening as she came up with a devastating performance in the second and third rounds, literally punishing Japanese Sena into submission. It was a demonstration of clever power boxing too. Sakshi was sure she was stronger than her opponent and after dissecting Sena Irie's strengths and weaknesses in the opening round, grew in confidence and went in for the kill. She found the Japanese girl's face and midriff with straight left jabs and hooks with greater success as the rounds progressed. Lightfly: Nitu (IND) bt Yuan Nie (CHN) on points 4-1; Zhazira Urakbayeva (KAZ) 0n points 4-1. Bantam: Sakshi (IND) bt Sena Irie (JPN) coach throws in the towel 1m:31 secs in 3rd round; Ivy-Jane Smith (ENG) bt Isamary Aquino (USA) on points 4-1. Light: Aeji IM (KOR) bt Ella Boot (AUS) on a unanimous pts decision 5-0; Vittoria De Carlo (ITA) bt Zhansaya Baltabekova (KAZ)on a unanimous points decision 5-0. Welter: Citialli Oritz (USA) bt Alina Popp (GER) on a unanimous points decision 5-0; Nataliya Sychugova (RUS) bt Canser Oltu (TUR) on points. 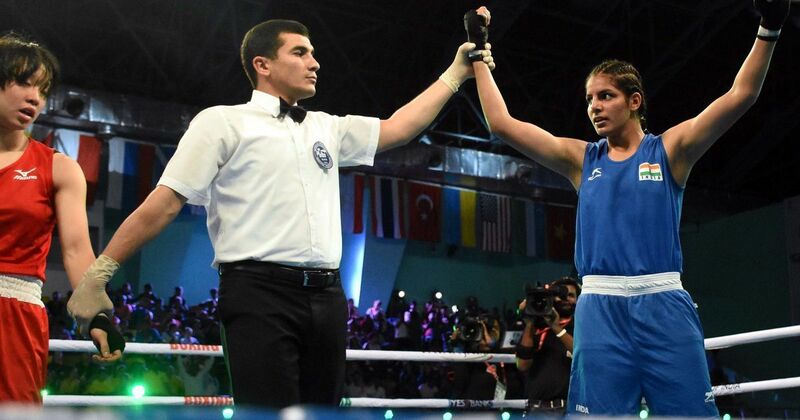 Light Heavy: Arailym Begdilda (KAZ) bt Yelyzaveta Sliusar (UKR) on points 5-0; Anastasiia Rybak (RUS) bt Anupama (IND) on a unanimous points decision 5-0.